Tarot by Woodsong - The Vardo Popup Style! Tarot by Woodsong -- The Vardo! The Vardo - The Pop Up Solution! Well, after all the pontificating about not needing hinges because real men can just lift up the walls, I decided that hinges really wouldn't be that bad an idea! 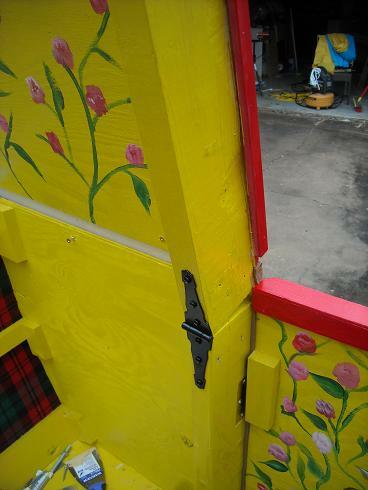 I still didn't want to fool with piano hinges or hinges attached to the 3/8" plywood -- but realized that I could use narrow strapping hinges attached to the 2 x 4 king posts! So ... that's what I did. You can see the result in the picture to the left. I used four hinges total -- two in the front on the king posts and two in the rear attached to the king posts. The hinge provides some stability to the post -- and once I screw in one metal plate on the king post, there is beaucoup strength; that king post ain't going no where! 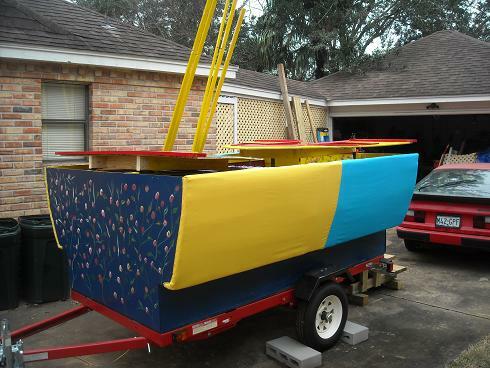 Now, I still wouldn't tow the trailer with the sides raised -- it's strong, but I don't know if it's 60 mph strong! But -- for my purposes it'll work great. The Vardo - Popped Down! The two ends don't quite meet in the middle -- but they're pretty close. The rear end actually rests on the bed -- so something's supporting it when it's down. The front end (the doorway end) was a bit of a problem -- there's nothing underneath it to rest on and it actually sags quite a bit when it's popped down. But -- I realized that I had a small "bench" that I was going to place outside the vardo. I was going to place the bench in the vardo when I was hauling it -- and if I placed the bench just right, the front upper half rests on it when popped down -- so the front gets supported! I can take the five stretcher poles and place them underneath the popped down ends -- there's a gap of an inch or so when they're flopped down. Once I pop the trailer down, I wrap the entire thing in a tarp -- don't have to worry about wind/rain/dirt/whatever blowing in while I'm towing the wagon! 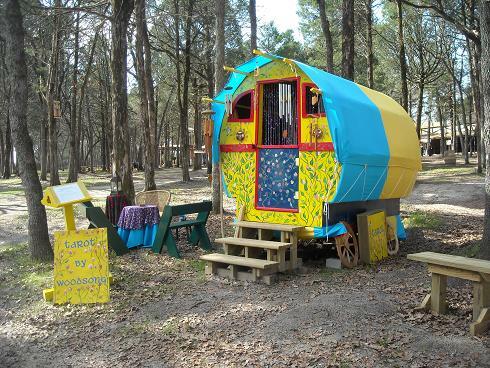 Here's a picture of the wagon in it's new setting at the Sherwood Forest Renaissance Festival ... it's still popped down and I haven't set anything up yet. Actually, there's not much set up yet at the time the picture was taken. 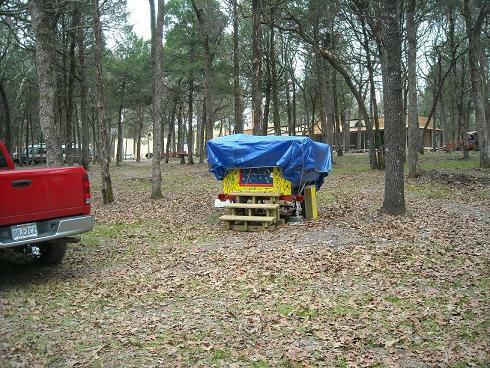 Mine was the second wagon/tent/booth in place, so the woods look kind of empty right now. They filled up pretty quick, though! The Vardo - Open for Business! And here's the completed product! That yellow "Tarot by Woodsong" sign leaning on the "music stand" post is also the top half of my door -- when I want to shut it down at night or during the week, I can slide the sign into place above the bottom door. Once I lock the bottom door, the wagon is secure. I was originally planning on doing readings inside the wagon -- but it turned out the weather and forest setting were so pleasant that everyone wanted to sit outdoors! So -- I added a table and some benches (I strongly recommend the Aldo Leopold plans you can download!). Later on, decided to add a patio-style umbrella (suitably embellished) for those sudden sprinkles. Darn'd if it didn't hit me that I was basically sitting underneath a picnic canopy doing readings -- what I wanted to avoid in the first place! I guess I learned a little bit -- it is quite nice outside next to the wagon. Plus -- you seem to get more business when folks can see what you're doing rather than them having to come and "knock" on your front door. The wagon steps worked great as a "waiting area" for the lines that would build up. Finally, I still used the vardo -- as sleeping quarters at night! Springtime in Texas is an interesting time weather-wise -- you might have an 80 degree day followed by a 20 degree day! The vardo held up fine in all the weather -- including some pretty fierce winds. It got cold at night a couple of times (in the 20's) -- I just turned on a small Coleman heater for a little while to warm up the wagon and it stayed that way. The insulation made a great difference (it would have been MISERABLE if the cold and wet winds were unstopped by just the poly-cotton top. The bubble insulation and tartan liner kept things warm, dry, and attractive. I still think I'm still going to coat the poly-cotton top with some water sealer -- it'll keep it a little nicer looking. Plus, I really don't care about the fabric breathing (with the insulation it becomes moot). The wagon was a great favorite -- little kids loved to come and jingle the wind chimes -- plus the constant breezes kept them humming as well. Hundreds of folks stopped to take pictures -- I think the wagon gave people an extra reason to smile! Would you like to receive free email tarot readings every week? Just enter your email address in the box at right, then press the "Submit" button. About every week, I'll email you a free general tarot reading and interpretation -- all human done, no machines involved! Join for free tarot readings!